Talking Electronics for $20.00 plus postage. This project will save you burning your food. and it will tell you when a TV program is about to start. These are the sort of things the timer can be used for. Just turn the dials to the required time and turn the project ON. When the dials are turned to "0" "0" the LED will flash but the timer will not beep. This project replaces an electronic timer bought some 15 years ago. It used a CD4541 chip with 24 timing resistors on two 12 position rotary switches and numerous other components to produce the beep. But the electros went leaky and 20 minutes extended to 35 and 1 hour on the timer never produced a beep. So this timer was born. The timing is determined by the oscillator in the micro and this is fairly accurate and reliable over a wide temperature range. It is certainly better than external timing capacitors. The only problem with the project is detecting the position of the wiper on the two pots. The ability to detect 10 locations on a pot is governed by the accuracy of the 100n capacitor and the value of the pot. The capacitors in our prototype had a 5%-10% accuracy but the pot had a 20% accuracy. Some 100k pots were 80k and others 91k. When this is combined, we get a wide variation. That's why we had to allow for an adjustment. We have specially made the timing so that you need to add a value across the 100n capacitors to get 9 beeps when the pots are turned to 9 0'clock. Extra 10n and 47n capacitors are included in the kit. You can connect two 47n in series to get an added 23n or put 10n across a 100n. One of our pots was 81k and the 100n was 102n. This needed 2 x 47n in series across the 100n. The other was 91k and 107n and needed 10n in parallel across the 100n. It is very difficult lowering the 100n so this is the best option. Once the pot corresponds to the numbers on a clock, the rest of the timing is done by the chip and uses a 1 minute routine that is called a number of times. The LED is illuminated for a very short period of time during approx each second and this is done within the 1 minute routine. The frequency of 3860Hz for the piezo was determined by using our Square Wave Oscillator project and turning the pot until the output was the highest. The frequency was then detected on a frequency meter and used in this project to get the best output. The 10mH choke increases the output considerably as it provides the piezo with a very high waveform. 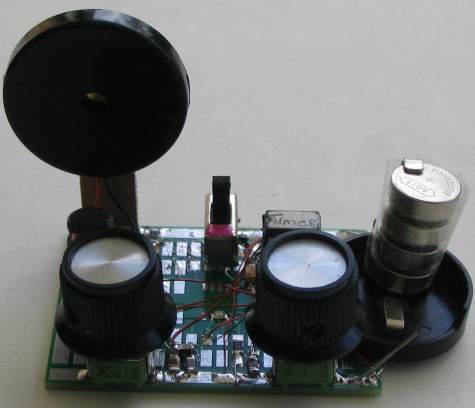 The piezo is actually a 22n capacitor and when combined with the 10mH inductor, the two work as a resonant circuit to produce the high waveform. The 100R, and 10u electrolytic across the piezo section of the circuit, prevent spikes and dips in the supply caused by the low impedance of the 10mH choke from upsetting the micro. The project takes approx 2mA during operation but considerably more during the beep. The first dial indicates the number of "minutes x10" and the numbers 10, 20, 30, 40 - - - - 90 are in the same locations as on the face of a clock. The second dial indicates the number of "minutes x1" with the numbers 1, 2, 3, 4, 5 . . .8, 9 in the same places as the numbers on a clock. Turn the first dial to the number of minutes x10 and you can add extra minutes by turning the second dial. Turn the dials and then turn the project ON. You will see the LED flash then produce beeps according to the number of "x10 minutes" detected by the circuit. If you have only selected the number of minutes x1 the beeps will let you know the number detected by the circuit. The LED will continue to flash approx every second to show the timer is working and the piezo will beep when the time has expired. If the timer squeals, the battery is flat. 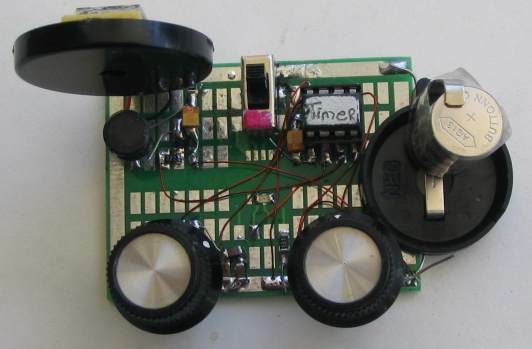 You can build the circuit on any type of Proto board. We have chosen our surface-mount board as it makes a neat project and you can see all the wiring at the same time. Use 4 button cells in a holder as the circuit requires very little current and they will last a long time. This project is part of a course in PIC Programming. See left index on Talking Electronics website: List of PIC Projects: for the projects in this course. The course consists of building these projects and modifying the programs to learn the art of programming PIC microcontrollers. Most of the projects are very simple however they cover many different routines and enable you to build up your knowledge. This project has been produced on our standard template and contains a number of sub-routines taken from other projects. The hardest part of any program is interfacing it with the outside world. One of these problems is to get accurate positioning of the pots. To do this we produced a sub-routine that created a value from a loop counter. We then adjusted the interval between each "look to see when the 100n was charged" and when the loop counter was 10 for the 10 o'clock position, it was complete. The 1 minute delay could be determined mathematically by counting the microseconds in the program but it was much easier to use a stop watch. Finally, the LED was turned on for only 5mS per 800mS in the 1 minute delay. This is less than 1% but the flash appears to be a lot longer due to the Persistence of Vision of the eye. The program contains a number a new subroutine that you will be able to "cut and paste" for projects in the future. If you want to modify the program you will need a programmer, a board to hold the 8 pin chip during programming and an adapter to connect between the programmer and PC board. These are covered in our article "Pick-A-PIC." The following program is for viewing. It may contain spaces or hidden characters that will not compile correctly to produce a .hex file. Use the .hex file above to burn your chip or the .asm file to modify the program. You can add additional features to this project by writing your own program or modifying the program above. Send any additions to Talking Electronics for inclusion in this article.